British Literature Plays Justification of the title of Sheridan's Play "The Rival"
Justification of the title of Sheridan's Play "The Rival"
Being a typical comedy of intrigue in the Restoration era, Sheridan’s play, The Rival is entitled on that light. The crux of the entire plot surrounds the rivalry of various characters for winning their prizes. Although a casual look on the title throws a comic colour, but in essence the title is purely satirical. On the part of husbands in general who doubt their mistresses of unknown rivals and the girls who found pleasure in surrounding themselves in contending rivals, the title creates an inherent satire. 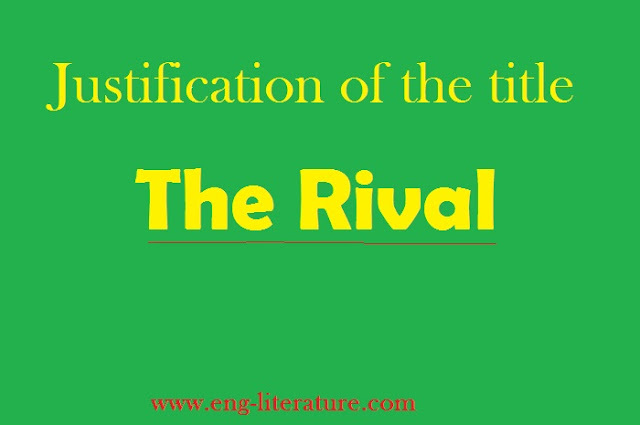 There are a few critics who argue that the title Rival does not carry a very precise relevance. It is often suggested that by this to title Sheridan was referring to the pseudo-rivalry of Captain Jack Absolute and Ensign Beverley. Captain Absolute has to assume the personality of a poor sub-lieutenant to tickle the humour of Lydia Lnguish, the romantic heroine, who is a lady of peculiar taste of eloping someone poor like Ensign, deserting all her fortune. But her aunt Mrs. Malaprop acts as a wall in between. Later she herself brings with the help of Sir Anthony, his son Captain Absolute as a suitor to Lydia and so rival to Ensign Beverly is provided. He is therefore at the same time in Lydia’s eyes, the two rivals—the adored Beverly and the detested Captain Absolute. Now, in the run of getting Lydia’s hand two rivals enlist their names – Bob Acres and Sir Lucious O’ Trigger. Bob Acres versus Ensign Beverly and Sir Lucius O’Trigger versus Captain Absolute are the avowed duels to be fought in the course of the play. Acres was encouraged by Mrs. Malaprop to become the suitor of Lydia and he thus hold the rivalry with Beverly. Acres is the type of the rich landlord of the countryside who tries to pose himself to be a city dandy by changing his country dress and style of hair and learning fashionable French dances. He is a coward at heart and does not like to fight a duel for the sake of his beloved Lydia though egged on by the fiery Lucius he sends a challenge to Ensign Beverly. A third rival is Sir Lucius O’Trigger, a poor Irish baronet who is duped by Lucy into believing that he has been corresponding with Lydia, and not Mrs. Malaprop though it was actually the reverse. He wishes to marry the rich heiress for the sake of improving his finances. Unlike Acres, he is not a coward and is ready to risk his life for the sake of making his fortune. The nodus of the three rivals is finally penetrated at King’s Mead Fields, where the three are about to be engaged in duels. The main problem of rivalry is solved when the identity of Captain Absolute is discovered by all. After that nothing much remains to be done than to bring Lydia round to accept Captain Absolute in his own person, and his rivalry with Beverly in the main plot ends. Bob Acres’s rivalry with Captain Absolute ends as soon as he comes to know his real identity. He takes the first opportunity to back out from the duel and promptly gives up all claims on Lydia. Sir Lucius also, when discovers his mistake of confusing Delia with Lydia, remains no more a rival of Captain Absolute.Then there are imaginary rivalry is too in Faulkland’s mind. And, being foolishly jealous of them, he not only prepares his bitter cup for himself but also tortures Julia. He too is purged of his suspicious nature in the end. All complications and riddles of the play end on a happy note as was typical of all comedies of manners. Hence we can say that the title of the play is not only befitting but the theme it suggests, serves to interlink the three plots. Who is Devi Saraswati? Let us try to know.